The drums and the dancing did not stop till late at Night at Bujhiling Village in THe Gambia, nominated by President Jammeh after TRUST Bank offered to Sponsor the Village under the ComAfrique-InteliZon Initiative.. The Implementation of the ComAfrique-InteliZon Initiative on the 27th of October with Famara Dampha of ComAfrique and representatives of TRUST Bank being welcomed with fervour at sunset. They now have Light - and thats not all. THey have a FUND that is village owned and village run. 72 Lights were distributed to the thrilled recipients. Each will contribute between 1GMD to 3 GMD per Day for their lights and telephone charging lights. This fund will be used to replace batteries and the lights themself. Sustainability in Development. Pictures and Comments will be posted soon. ComAfrique along with its Senegal partner TATA Africa Senegal - participated in the LIGHTING AFRICA Conference held at the Radisson Blu in Dakar, Senegal on the 6th / 7th of October, 2010. While the initial reaction to the initiative was lukewarm, especially under that the impression that the ComAfrique Initiative was just giving lights away free, the response from World Bank officials and organizers changed for the better when they understood that we believe that light should be delivered to the nooks and corners of the world - especially in Africa where governments are unable to do so. Thus Initiatives such as ours, which deliver the means to have light, yet insist that the villagers pay for the light and not the instruments, takes sustainability to a new meaning. We continue to believe that while Off Grid Simple Solar Instruments of Light, should be made accessible to all corners of Africa, in a commercial manner, when it comes to providing basic light for rural Africa, the governments and development agencies have a role to play. and if this role is shared by the corporate and private sector, it should be welcomed. 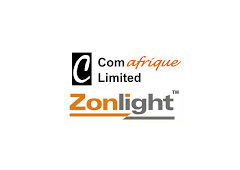 ComAfrique, along with InteliZon are getting their already successful ZonLights and ZonHomes tested by Lighting Africa, and will look forward to a beneficial partnership, where we can add value to Lighting Africa s program. In response to ComAfriques request, Trust Bank Managing Director, Mr Pa Njie along with his team have graciously offered to sponsor a village under the ComAfrique Initiative. The Office of the President have nominated the village of Bujhilling in the Foni District of The Gambia. Watch this space as ComAfrique implement the Initiative in Bujhilling. In a move towards farmers gaining access to sustainable lighting, ComAfrique have come up with yet another sponsor - a benevolent one who choses to remain known as an associate of ComAfrique. ComAfrique have suggested that the President nominate a village in The Gambia and are thus waiting for this nomination.